Where do these balls come from?� The audiences will have such questions when they watch the effects of this prop. The magician shows two exquisite black boards and put one in flat and the other one vertical to it. Pull them horizontally, and a beautiful shinning ball. Repeat and there can appear altogether four balls. Made by acrylic and printed with beautiful design, the Mira ball is exquisite, beautiful and durable. Four ball is made of white plastic plate. The Mira ball is made exquisitely. The board is made of thin and has the beautiful design. It not only has a special principle but also has pasters on its appearance. 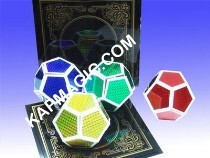 Moreover, the color of the ball is different from each other, there altogether four colors: silver, green, red and blue.